A man in a pick-up truck on a Washington highway was carrying a crate with piglets. 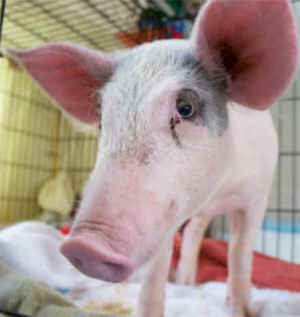 He slammed on his brakes, the crate broke open and as he made a sharp turn each piglet fell out onto the highway to be hit by cars and killed. All but one, and she is Elsie! Elsie was VERY sick with pneumonia on top of recovering from car accident trauma and an injured leg. Elsie barely moved as it takes all her energy to breath. It took a long time to physically recover. Elsie was terrified of people. Elsie was chased and caught to be crammed in a crate with others, totally traumatized with falling out of a moving vehicle onto a highway and seeing her siblings killed. Then chased and caught by her "rescuer" to be brought here! When first here Elsie had painful, labored breathing sick with pneumonia. She was trialed with a second antibiotic after no recovery with a week of injections. After two weeks and a third powerful antibiotic her pneumonia was gone and she was able to survive anesthesia for x-rays of her damaged leg. When she fell off the truck onto the highway she must have landed on her hip. The x-rays showed a severely broken and shattered hip that is irreparable. The prognosis is extremely poor with Elsie being crippled her entire life. After x-ray she was sent home to total confinement in the house for 8 weeks. Her only hope for any type of healing is to be non weight bearing for 8 weeks. A fast growing farm piglet in the middle of the living room is work and a joy. Elsie just had follow up x-rays with the worst results. My heart sank as I saw the x-ray and listened to the veterinarians recommendation of euthanasia now. Elsie will never be able to walk well, her good leg will break down trying to support the entire body. Pigs are genetically built with too much weight supporting all four limbs. They grow fast and as she grows large it will be unbearable. They are not like other species. 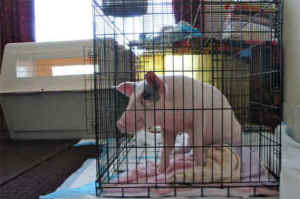 I brought Elsie back home to the sanctuary with the intent of giving her a life as a happy piglet with the others. She will have the best life she can until her body and her spirit say no more. This is all so sad to think about. Today I will do the best I can to give her joy. Elsie confined for 8 weeks to limit her mobility. 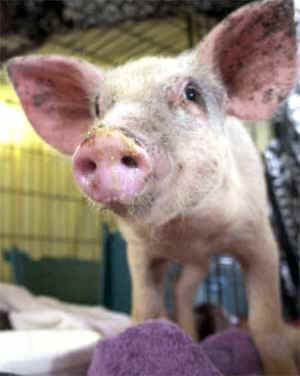 Your support of Elsie and Pigs Peace Sanctuary is a shout out Yes for the value of her life!